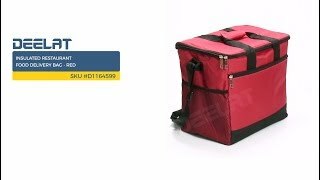 This insulated restaurant food delivery bag is perfect for delivery of food from your restaurant, kitchen, pub or bar. It also is great for personal use, picnics, camping and any dining on the go. It features an ample size so that you can fit everything that you need for you and your loved ones. There's a sturdy handle made from non-woven fabric that is super durable and easy to grip, and there's also an aluminum foil interior so that all your items stay at the perfect temperature until you're ready to eat them. All in all, customers love this insulated restaurant food delivery bag. It is easy to use and delivers food, warm or cold, without temperature variation, every time.